In my last post I showed some of the brooches I’ve been making out of Tyvek. 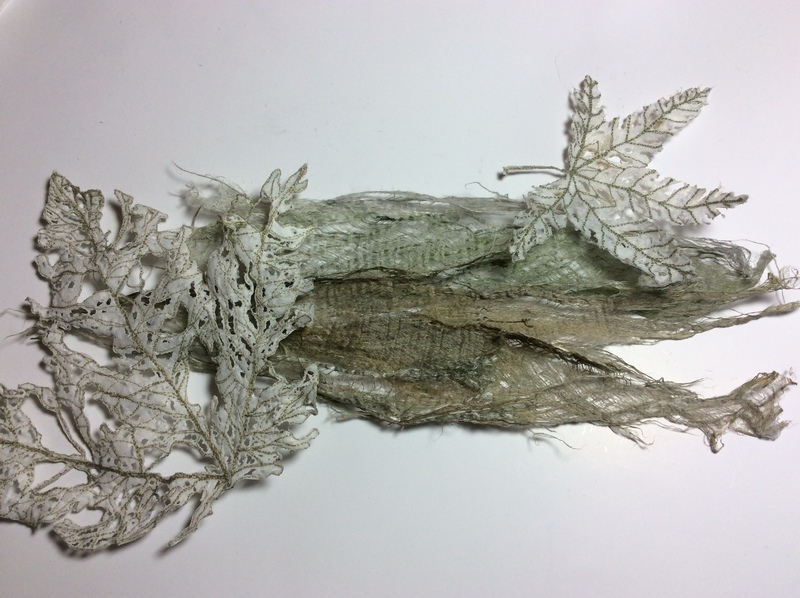 This month I thought I would continue with the “man made” fabric theme and show you how I make my Lutradur leaves. Lutradur is another exciting non woven product which was originally designed for industrial applications including construction substrates, landscaping materials, residential and commercial wallpaper, carpet backings, automotive floor mats and carpeting, and specialized filtration devices. It is an incredibly versatile material which is available in various weights including 25gsm, 30gsm, 70gsm, 100gsm and 130gsm. It does not fray, some weights are translucent, it can be painted with any paint medium, dyed, distressed with a soldering iron or heat gun, glued, stitched, layered and embroidered. In fact, think of an application and you can probably use it! Lutradur is available in packs of A4 size sheets or by the metre from various suppliers including Spunart in the UK. 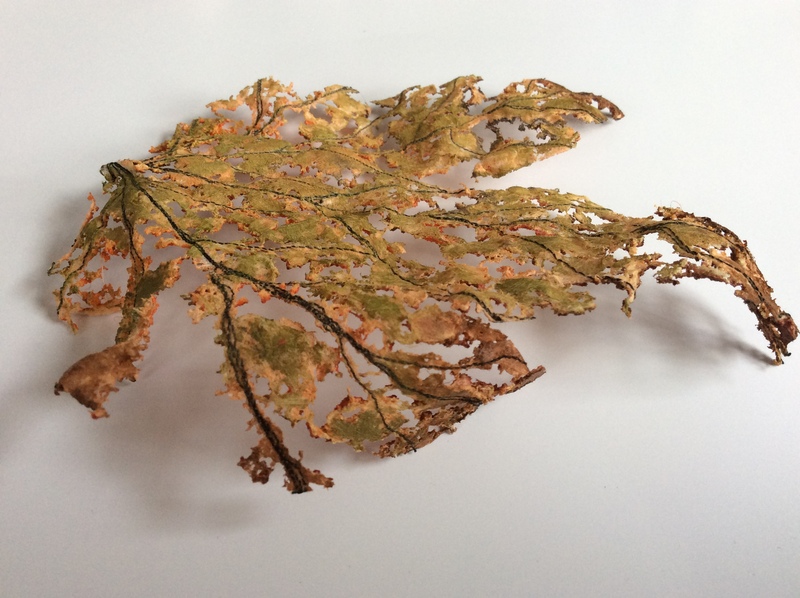 My first attempt at using Lutradur was a couple of years ago when I made this leaf using 100gsm….. I drew the shape directly onto the fabric, free motion stitched over the lines and then painted it with Inktense before cutting out the shape. You can see how the colour altered once the Lutradur had been zapped with the heat tool. I was pleased with the result but there was something not quite right which I couldn’t put my finger on…..until recently. 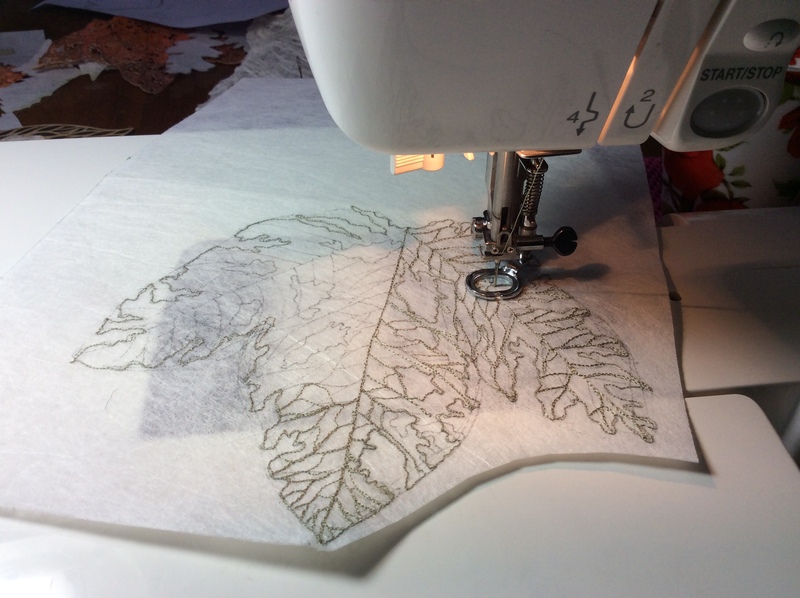 Its staring me in the face looking back at these photos, I shouldn’t have sewn around the edge of the leaf! 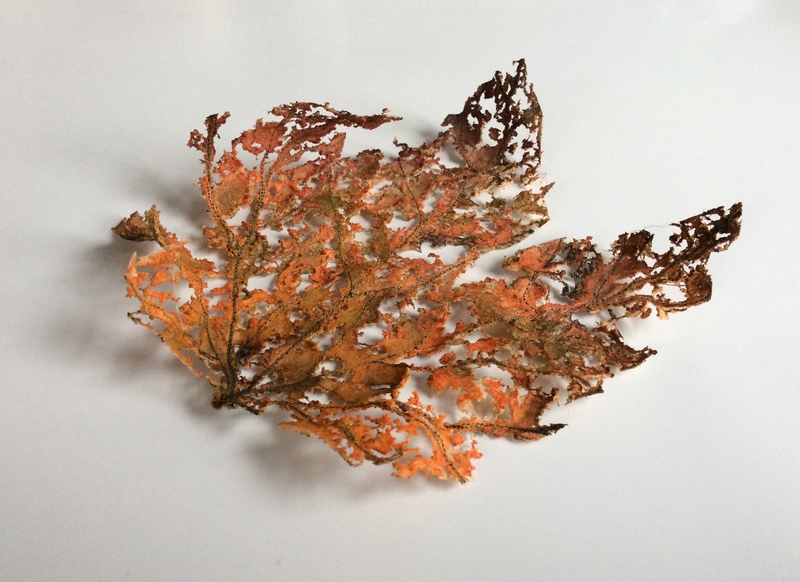 This is that same leaf after a little pruning of those edges and another blast of heat to curl the tips, it looks so much more realistic….. 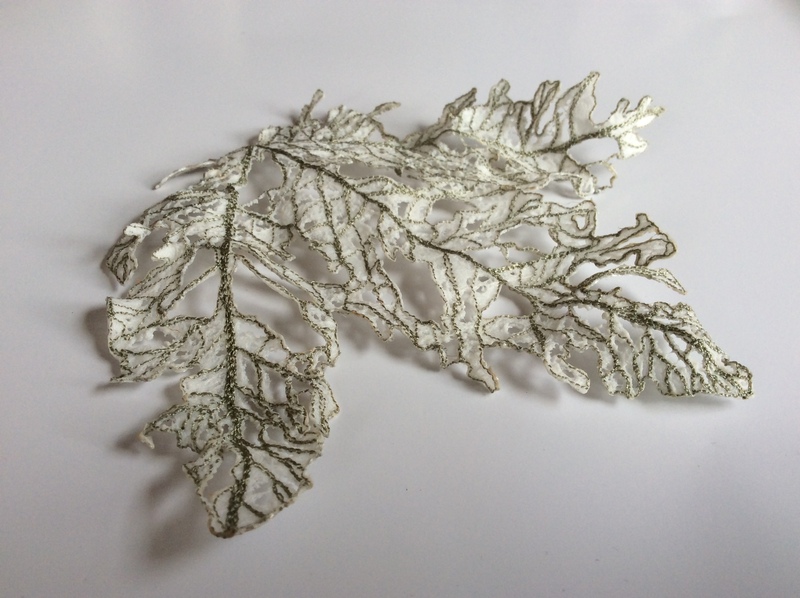 These are some of my more recent Lutradur leaf creations made from 100gsm…..
Lutradur provides a very stable surface for stitching into. Each one is drawn first using a Frixion pen. Next I use a heat resistant thread i.e. Rayon, Viscose or 100% cotton to add free motion stitching along the veins. 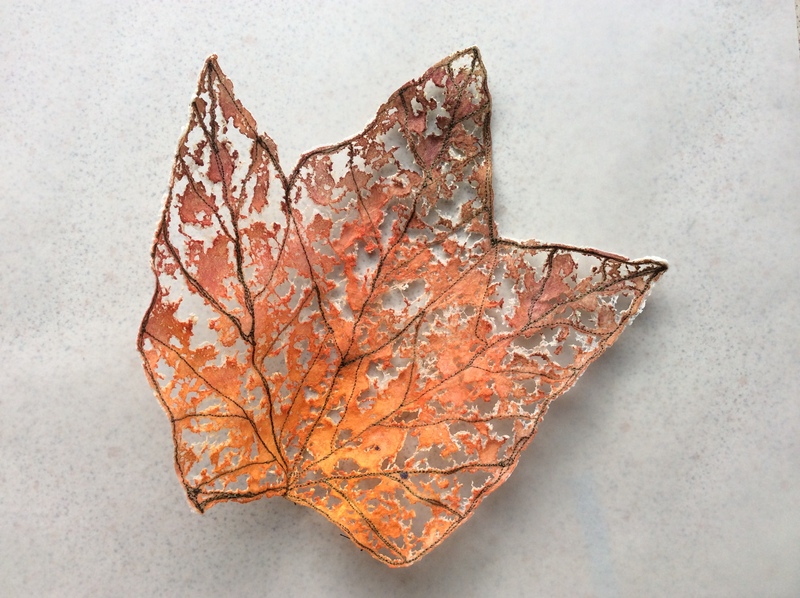 The fallen leaf which inspired the design. Shaping with the soldering iron. 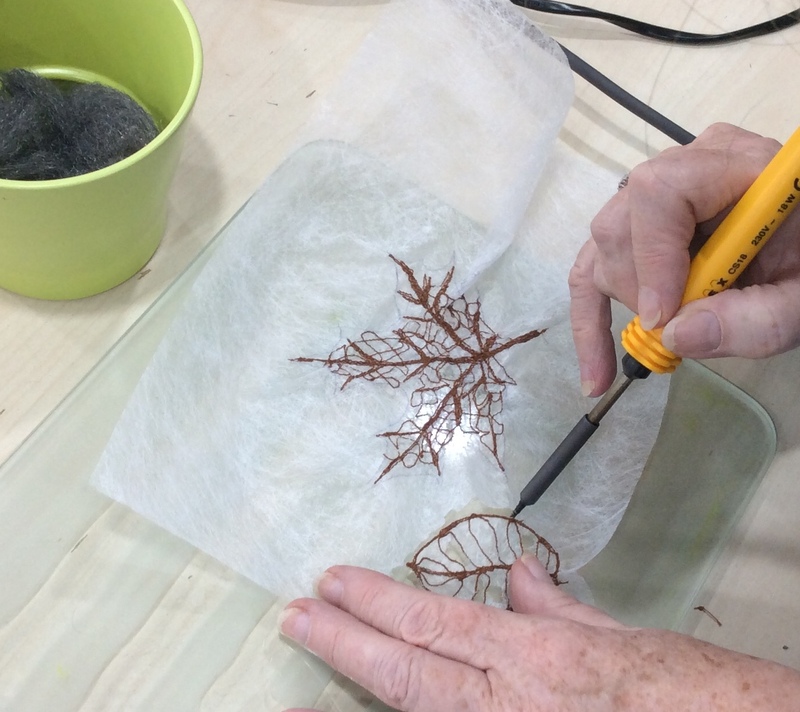 Once the stitching has been done the leaf is cut out using a fine tip soldering iron. 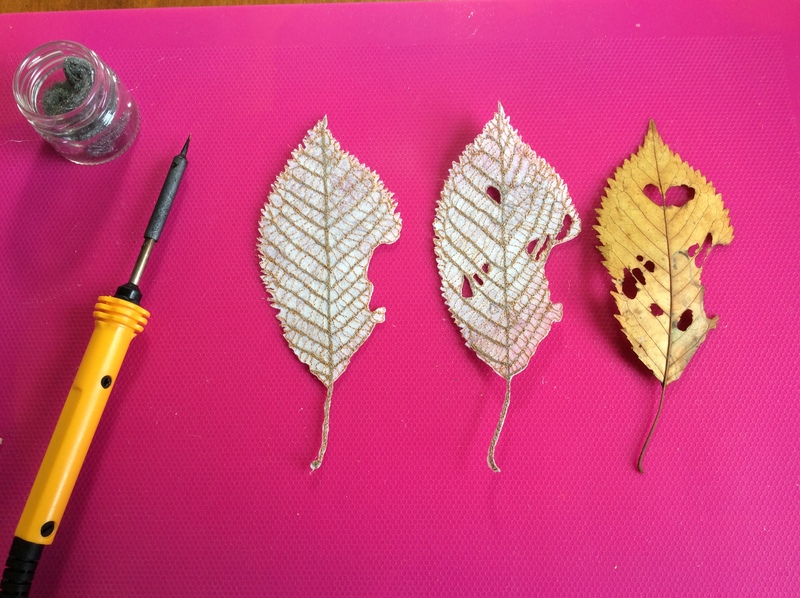 I wanted to retain most of the fabric on these particular leaves so I also used the soldering iron, rather than the heat tool, to target specific areas to cut holes. 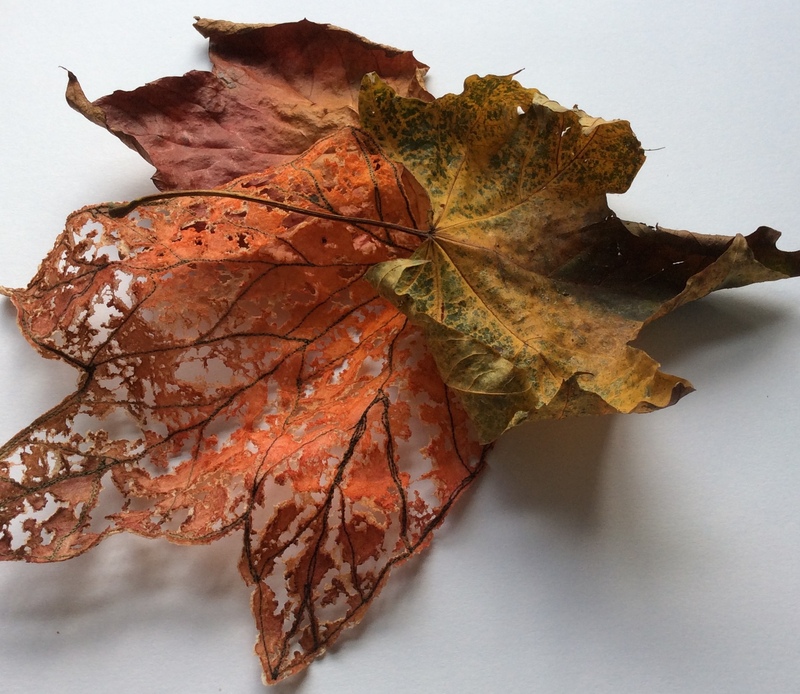 The finished leaves painted with Inktense. 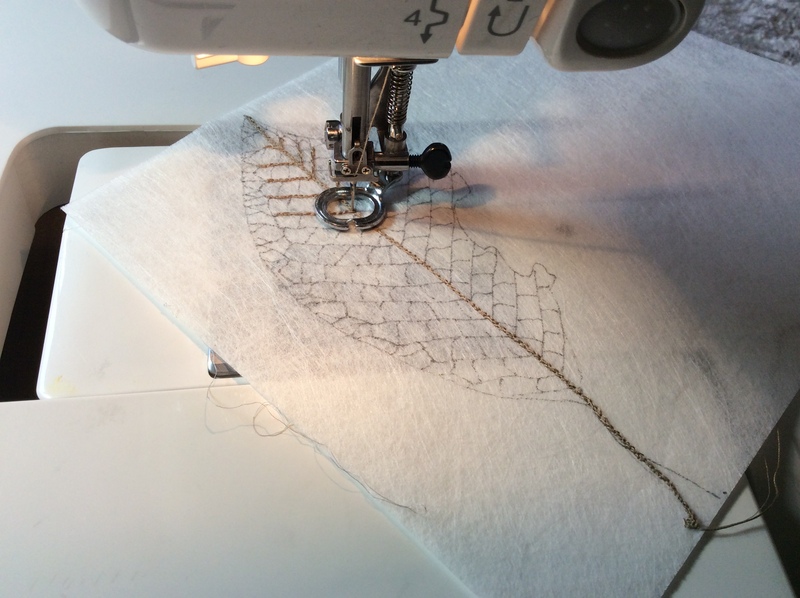 I wanted a more lacey look for this next leaf so after stitching and cutting out with the soldering iron this one was distressed using the heat gun. I left it unpainted to suggest a frosty leaf in winter….. 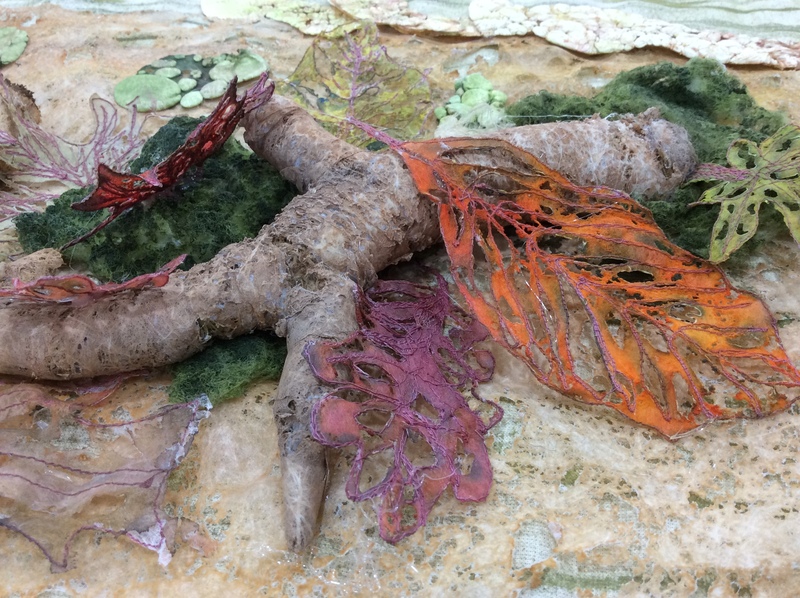 The following photos show a selection of leaves made by students at my recent “forest floor” themed workshop….. 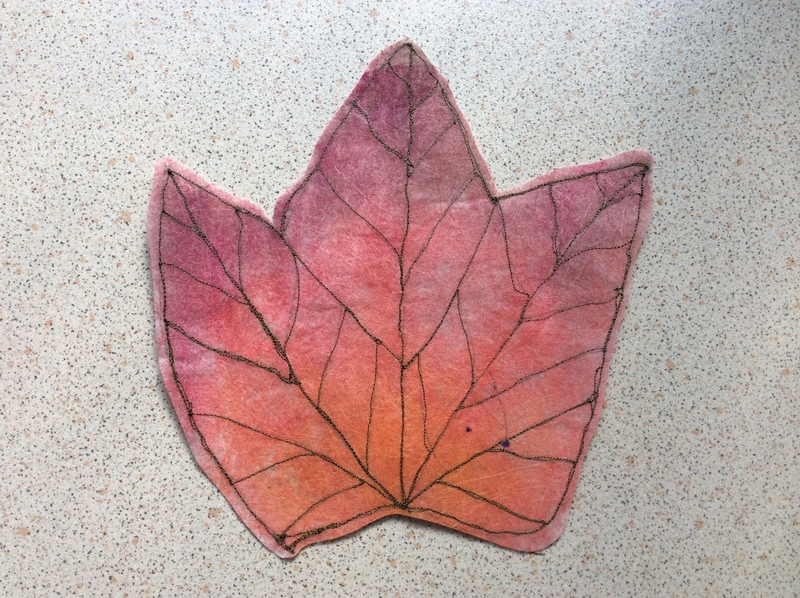 These leaves are fun to make but be warned, as with so many creative projects they can become very addictive once you get started! 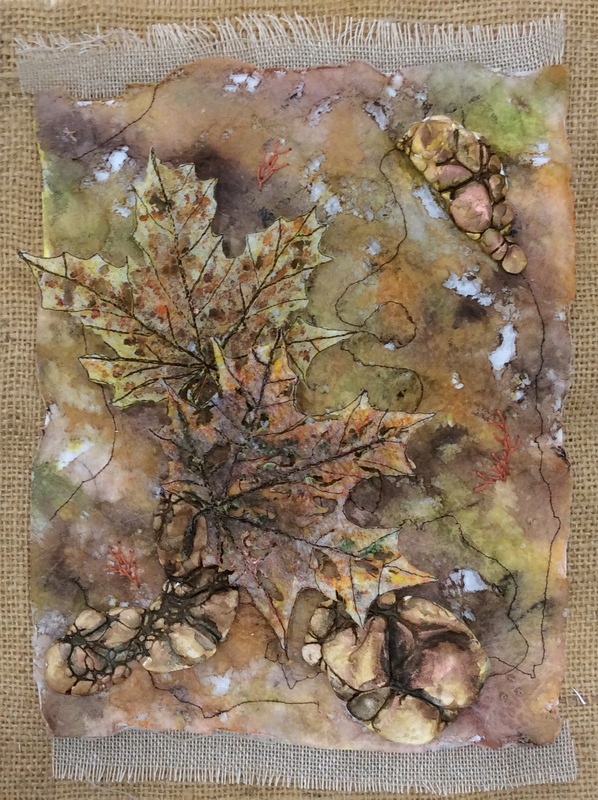 This entry was posted in Free Motion Stitching, Guest Writer, Mixed Media and tagged Forest floor, Free motion stitching, Lutradur, Lutradur leaves. Bookmark the permalink. Love your lutradur leaves. Did you know that dryer sheets are made of lutradur? Be sure to wash them before stitching — otherwise they’ll “gum-up” your machine. Thanks Frances. I’ve heard of folk using dryer sheets in their textile work but didn’t know they were made from Lutradur! Love it, love it, love it! I can’t wait to try this. Did you have to wear a mask when you used the soldering iron on the Lutrador? If so, what type of mask? I once use a soldering iron on craft felt wearing what I thought was the correct mask. The fumes made my throat hurt for a few days, and it felt very toxic. It has scared me of using a soldering iron on materials. Was this an issue for you with this process? I can’t advise on masks Karen as I haven’t had an issue with fumes, at least not as far as I am aware of, so don’t wear one myself. I only work on this for a few minutes at a time and do ensure plenty of ventilation but I’m sure you are right, we really should be wearing masks! These are fabulous. You and Ruth have already inspired me to get some tyvek paper and it is sitting on my table awaiting paint. I saw the Lutrador advertised at the same time but it was more expensive than the Tyvek andI gave it a miss as I didn’t know what i could do with it; now I do know. Its just perfect for leaves. Thank you for sharing. That’s great to hear you’ve been inspired to have a go! Have fun with it all! Beautiful Karen! Thanks for sharing! What will you do with leaves? Last year I added lots of them to an art quilt and more recently I’ve added them to a “tree bark” inspired hat. 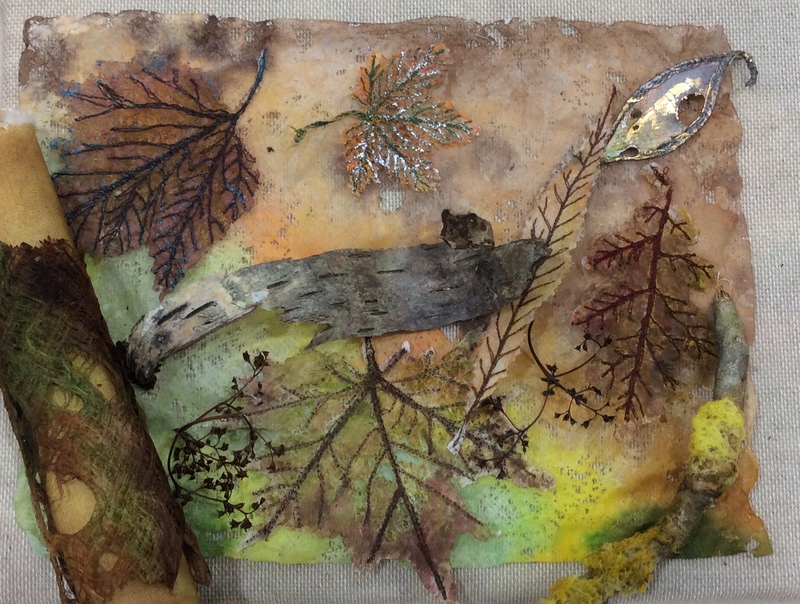 I also use them as samples for my Forest Floor Workshop where students create a piece of wall art based on that theme. You must try it! I’ve ordered some very lightweight Lutradur this week so plan to do more experimenting with that. It creates lots of possibilities! Fabulous experiments Karen with great results, thanks for the detailed process. Glad you liked it Tracey. Thanks Karen and Duh!!! I never thought about not stitching around the edges and it does look so much more realistic, doesn’t it? Your yellow leaf looks just like the original. Yes, it’s funny how it suddenly occurred to me when I was sketching the yellow leaf. I figured it would look more realistic without a solid edge and realised that was where I had gone wrong with the first leaf! Wonderful Karen, thank you. Do you know if it goes by other names? Yes Kay, it’s also made by Vilene and known as CS800 or Spunbond. Thanks Judi, you should give it a try! Very Cool stuff and thanks to Frances I can wash some used dryer sheets and may be give it a try. I’ve never used dryer sheets but I’m guessing they are soft and pliable? The Lutradur I buy is a stiff fabric so it will be interesting to hear how the sheets perform. Thanks Leonor. 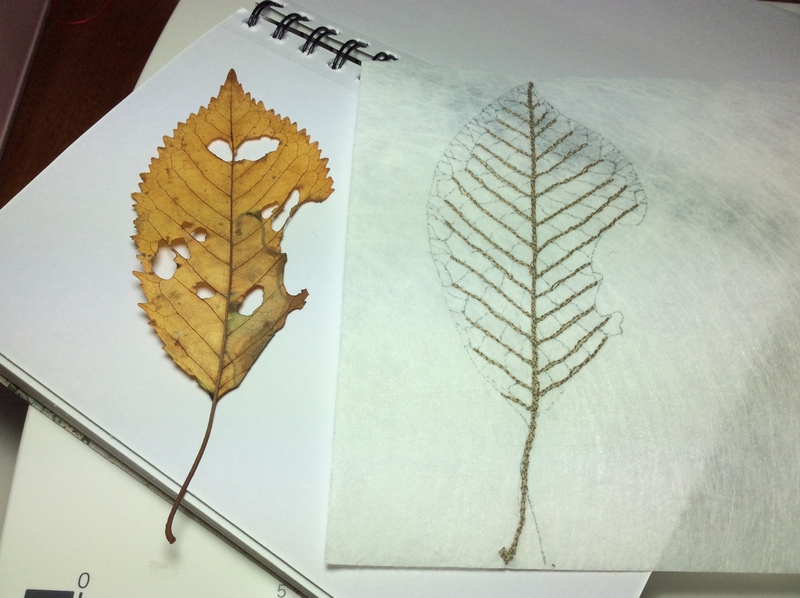 You can get such wonderful detail with this technique which makes it easy to replicate a particular leaf. Beautiful. Lay your leaves on the forest floor and you would think they were totally real. Using the soldiering iron is a great idea for more subtlety. I shall be looking out for dryer sheets to try this technique….Oh dear there goes one of my other projects unfinished! Have fun and don’t feel guilty…..hopefully they will all get finished one day! Thanks Zed. It’s wonderful stuff to work with. It will be interesting to hear how your pound shop paper performs. If you need to buy any Lutradur I can recommend Spunart for price and quick delivery. 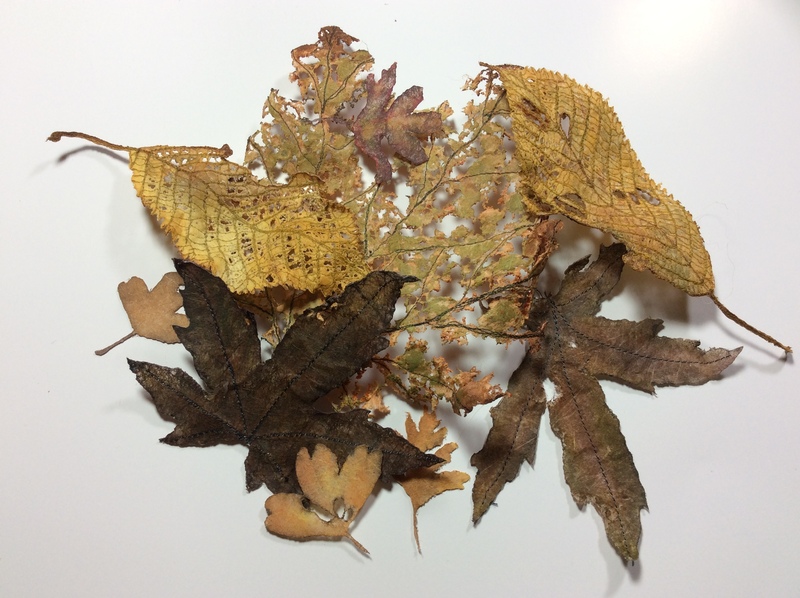 Hello, these leaves are wonderfull, I want to try … What kind of color do you use to paint them?